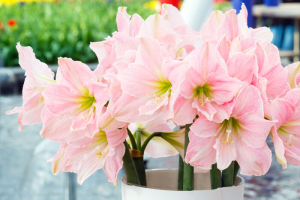 Amaryllis flowers in bloom are spectacular additions to any garden or bouquet. 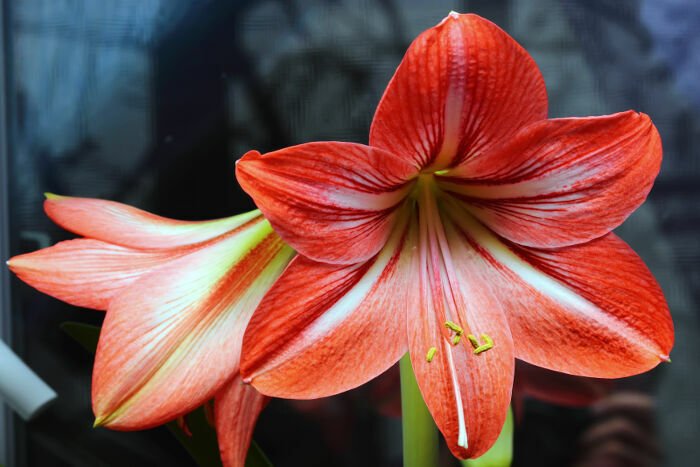 Originally from tropical lands like the Caribbean, South Africa or islands in the South Seas, amaryllis can be found all over the world, except for Antarctica. Grown from bulbs, each plant produces from two to five flowers which stay in bloom an average of a remarkable six weeks. 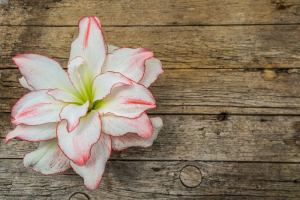 What Does the Amaryllis Flower Mean? Since the plants are so large, they seem to call attention to themselves by towering over other nearby flowers. They first came to the attention of European gardeners in the 1800s. They seemed awfully grand to the Victorians, so they became associated with pride. However, calling someone “full of pride” was often a compliment in Victorian times. Prideful women were often thought to be beautiful. 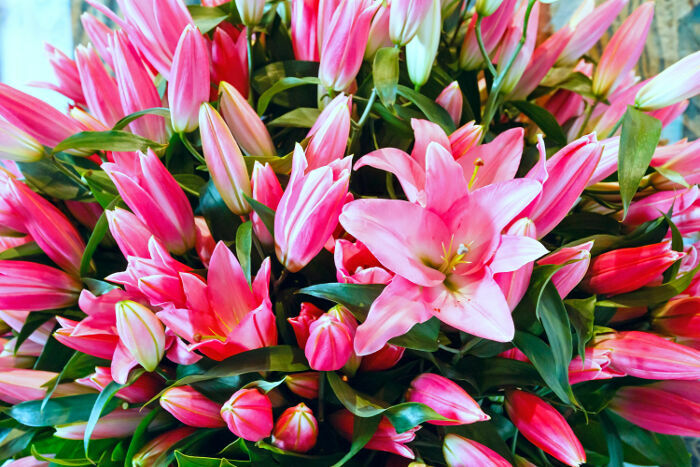 The Greeks called these beautiful flowers Amarullis, which means “splendor” or “sparkling.” The word seems to come from a character in a popular poem by Virgil. 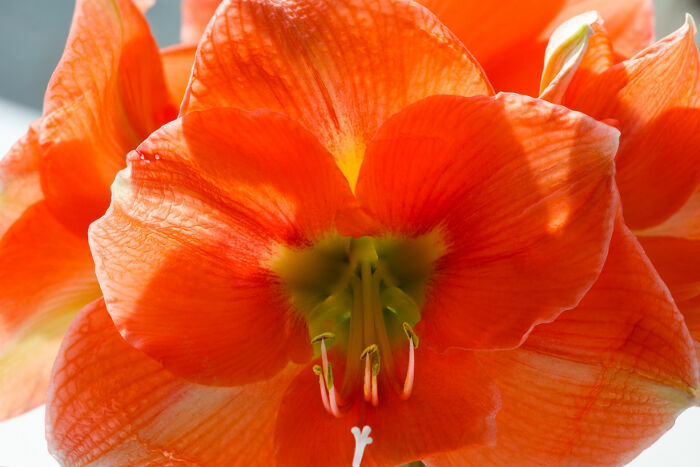 The nymph Amaryllis had a dramatic way of declaring her love for a gardener named Alteo. She pierced her heart with a golden arrow at his door every day for one month. That’s why amaryillis flowers are often a deep red. Unfortunately, the gardener was unimpressed with Amaryillis’s bloodlettings and ignored her. 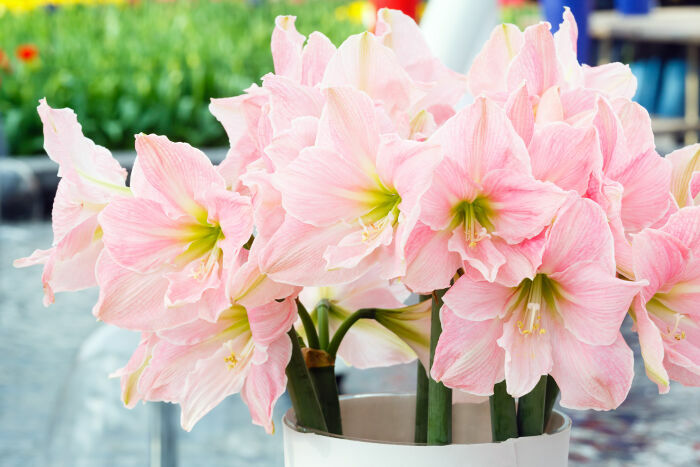 The Romans, who often spoke Greek for informal occasions, borrowed the Greek word and turned into the Latin Amaryllis. Modern English just picks up where Latin left off. Although taxonomists and botanists may quibble over what exact species are amaryllises, the symbolism hasn’t changed much in centuries. In antiquity, amaryllis symbolizes the blood of the love-struck nymph Amaryllis. For the Victorian gentlemen, an amaryllis means a strong, self-confident and very beautiful woman. A star-shaped or trumpet-shaped amaryllis also symbolizes pride. 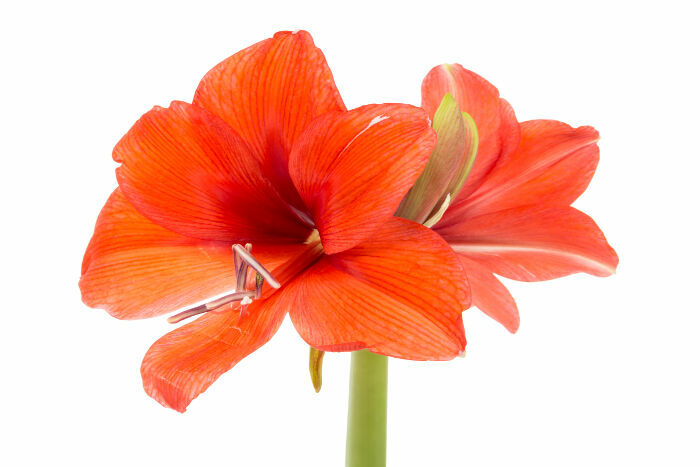 Not all of the flowers known as amaryllis in nurseries and florists are considered true amaryllises by botanists. The other flowers are in the genus Hippeastrum. 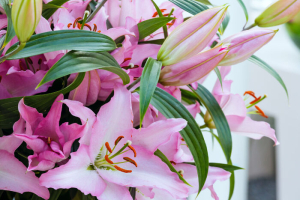 Other common names for amaryllises are naked ladies and belladonna lilies. An amaryllis bulb can live up to 75 years. Amaryllises are distantly related to lilies, which explain why many are shaped like lilies. Some species of amaryllis grow flowers up to six inches in diameter. 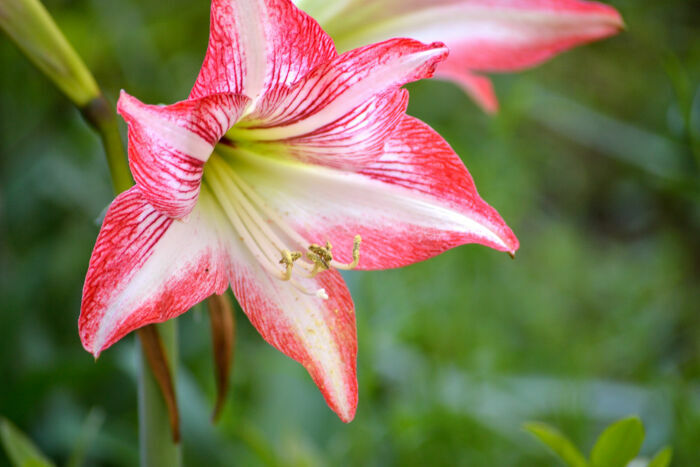 Amaryllis flowers can attract carpenter bees. Bees are needed by the flowers for pollination. Red amaryllises are often sold as alternatives to poinsettias around Christmastime. Amaryllis are best known for sporting red or red and white blooms, but they also come in other colors. Some varieties are multi-colored. Color sybolism for the amaryllis can also be applied to many other decorative flowers. Red: Means passion, love (whether requited or unrequited) and beauty. In China, red is a lucky color. Purple: Some shades of purple amaryllis varieties are quite dark. Purple symbolizes not only royalty, but the spiritual side of life. Orange: Means good health and happiness. White: Means purity, femininity, children and innocence. 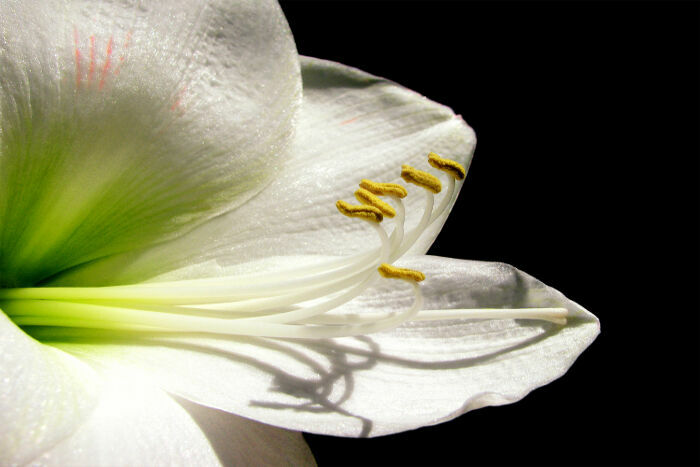 White amaryllis that resemble lilies symbolize mourning for a loved one. Pink: Not just for girls, but also for love and friendship for both genders and for people of all ages. Yellow: They are a symbol for happiness, luck and good times ahead. Unlike many other decorative flowers, there is no tradition of medicinal cures attributed to amaryllis flowers or any products made with amaryllis bulbs or plants. Flowers are used to make essential oils for perfumes and aromatherapy products. The scent is thought to both relax and energize. Unfortunately, the flowers, leaves and bulbs are poisonous not only to people but to dogs and cats. Keep these plants away from the inquisitive mouths of children and pets. with it? Any suggestions please will be much appreciated. Thank you for your time & much needed information. Have a sunshine day.